Thank you for joining my blog. 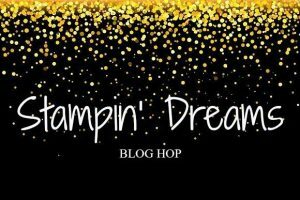 Whether you have join me or have come from Jo Anne’s blog I hope you enjoy this month’s Stampin’ Dreams blog hop. Today I am taking part in a global blog hop. As a Stampin’ Up! demonstrator I love this time of year when the NEW Annual Catalogue is winging its way to each demo meaning that we can have a sneak peak and order some of the new products. One of my main passions is Scrapbooking. When I saw the Delightfully Detailed laser cut 12×12 pages I just had to order them. 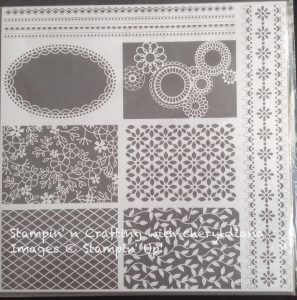 In an earlier blog hop I showcased one of the pages that can be cut to make cards with but I also wanted to showcase the other page available in the set, which is a whole 12×12 page. It is absolutely gorgeous and I will certainly be buying a few more packs when it is available to everyone in June. Like all scrap-bookers I do have a lot of photos waiting to scrapbook and I recently found a couple of photos from my parents wedding. Of course in 1964 most photos were black and white so the photos I found go really well with the laser cut paper. I love our 2017-2019 In Colours and was extremely happy to find out that the 12×12 card stock has been carried over into the new catalogue. I chose the Powder Pink card stock as it is a lovely subtle colour. I finished off my journalling block with one of the corner stamps from the NEW Around the Corner stamp set. 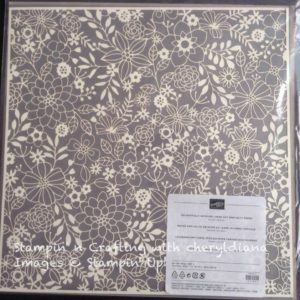 I hope you have enjoyed visiting my blog and seeing the fantastic Delightfully Detailed laser cut speciality paper and how you can make lovely scrapbook pages using it. Please do leave comments if you have time and please enjoy your next visit to Sandra Robert’s blog and see what lovely projects she has for you. Love this laser cut paper. Can’t wait for mine to arrive. What a gorgeous page. I didn’t order this paper but you are making me want to add some to my stash! It’s gorgeous. That paper is perfect to scrap a wedding! Such a pretty page! How perfect to use that gorgeous lacy laser cut paper for a wedding theme! 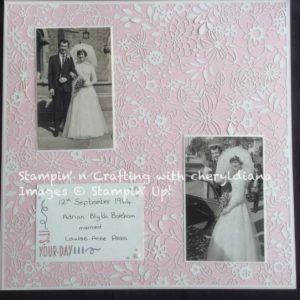 What a simple & stunning scrapbook page background that laser paper creates. Nice way to highlight those treasured wedding photos. How gorgeous is this background! Thank you for the inspiration.